Thresher Square tower crane is up. Cool! We're up to 17 cranes again. Hopefully 20 by the end of March. You can even see the Nye's crane back there. That is a great angle and in another two weeks you won't be able to take that photo. I am so excited for this Trader Joe's. Only having to bike/drive 2 miles compared to having to go all the way over into St Paul or Edina is going to be absolute perfection. I can't wait I love biking by and seeing the progress on the way to work every day. I'm pretty excited too. While there are certainly closer grocery stores to me, the Blue Line trip is just 11 minutes from 46th to USB Stadium (plus 4-5 minute walk time on either end). Very doable for an occasional trip to Trader Joes, even if my primary store is somewhere closer to home. At least now with the new store I won't feel like I have to stock up on an entire freezerfuls of that delicious crack-level-addictive Mandarin Orange Chicken every trip. For some reason they took apart the boom of the crane and put it back together this weekend. I thought first it was the Moxy crane going up, then I thought they were taking down this crane. But when biking in this morning I saw that it was put back together. I remember when everything was under construction a block north, back in 2004-2005. It's so cool to see the parking lots disappear finally. Tcmetro wrote: I remember when everything was under construction a block north, back in 2004-2005. It's so cool to see the parking lots disappear finally. What were they building back then? I think that's when they were building all the apartments across from the Guthrie. 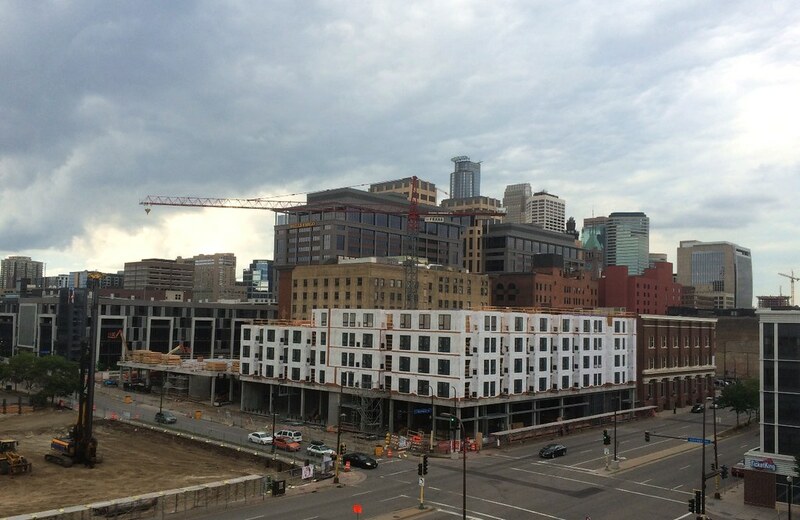 I noticed that you can see the new Nicollet tower going up in that photo. 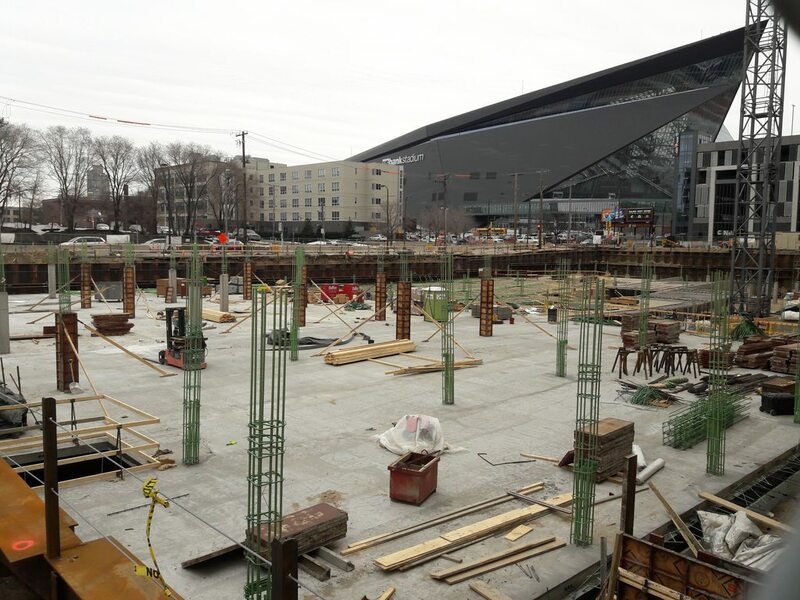 Given that this lot is filled, a new complex will be going up across the street and Ryan might actually their building going atop the ramp across the street to the south...this neighborhood is really changing! SurlyLHT wrote: I think that's when they were building all the apartments across from the Guthrie. 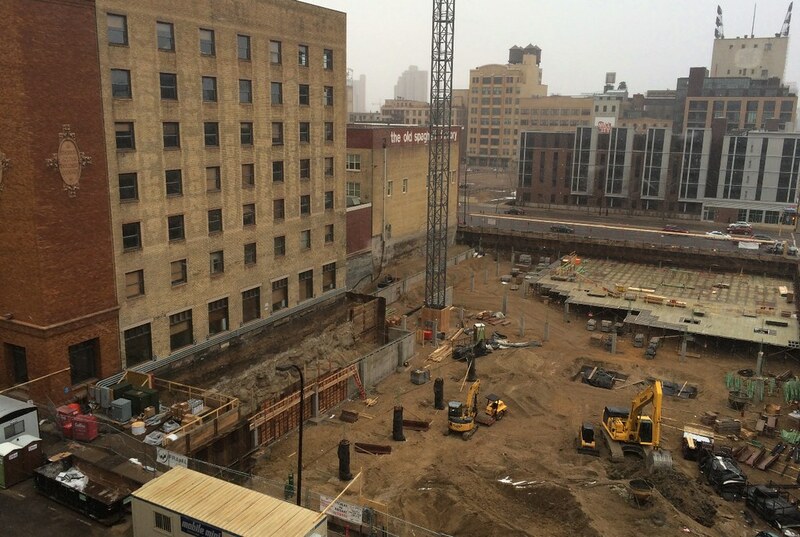 I noticed that you can see the new Nicollet tower going up in that photo. Given that this lot is filled, a new complex will be going up across the street and Ryan might actually their building going atop the ramp across the street to the south...this neighborhood is really changing! It really is filling out nicely. I am looking forward to seeing what Minneapolis will look like in 6 to 10 years. Hell, even five years from now it will be so different. Guthrie, Bridgewater, the parking ramp wrapped with units at Washington and Chicago, and the units on Park. The only things in the Mill District were the Depot, the hotels next to the depot, the big condo bldg from the 80s, the Mill City Museum, the condo conversions in the old buildings next to the museum, and the relatively new office building on Washington. Everything else was parking lots (including where the park is now), except for the suburban-style offices near the freeway. Well actually...most of the land along Washington down in this area was railyards and some grain elevators..it was not part of the gateway project...was empty to start with.